Justin and Larry Henry of J & L Farm in Scroggins, Texas, are noted for their outstanding performance and the pristine conditions of their farm. J & L Farm is a father and son operation. 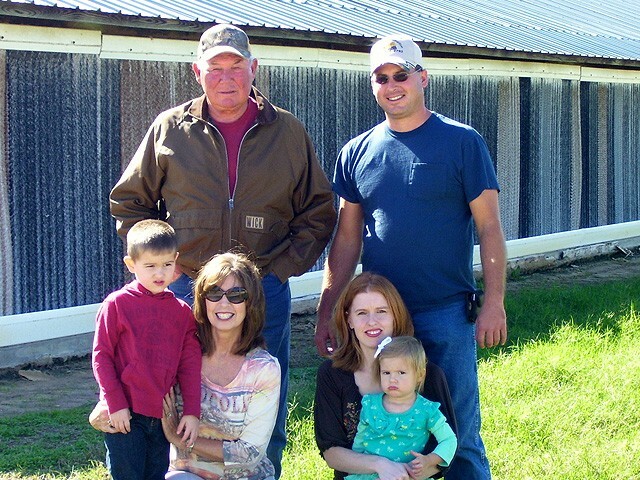 The parents, Larry and Joyce, have run beef cattle on 300 acres for 30 years. Justin added six 500-foot-long chicken houses on the farm in 1998. Larry also ran a dairy supply business, but has since retired. Both families, including Justin’s wife, Lynzie, and their two children, Jake (4) and Adalyn (2), live nearby the farm, but not on the land itself. The Henrys have one hired hand who also lives at the farm. The farm is fairly sophisticated with each house having a computer system to keep the temperature at the exact degree to make the chickens most comfortable. Along with walking the houses to check the safety of the chickens, ensuring they are properly fed and watered and that the houses are clean, the Henrys keep the equipment maintained and running. “We help each other. I mainly take care of the chicken houses and grow chickens. My dad runs the cows, but he helps with the chickens too,” says Justin about the father-son partnership. Justin grew up running cattle on his dad’s farm; however, he thought there was more of a future and better money to be made in poultry farming. The family produces 127,800 chickens in each of their four-and-a-half flocks per year. They currently produce a little over half a million chickens annually, though they have produced more in the past. These broiler chickens are grown for consumer sales. The fact that their farm is in pristine condition is a big factor in their being chosen as Grower of the Month. Wright notes that the Henrys take special care of the birds and pay close attention to detail. They also take several sustainability measures on their farm. “They are conscientious as far as taking care of the birds. They have a water policy management plan. They understand agriculture, they follow all the recommendations, and they do a really good job,” says Wright. Henry agrees that he and his father take pride in their farm and go to special effort to keep the farm in great condition. The thing Henry likes best about running a poultry farm is being outside and being his own boss. He also likes doing something that’s a little bit different.